With the piles and piles of review books that I feel like I have been drowning in, I decided to make a true effort to read something of my own personal library. 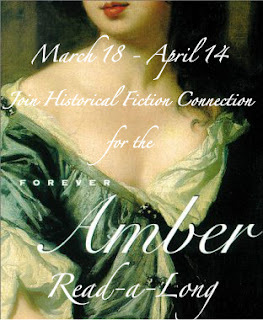 Yet, the only way to do that was to physically pencil it in my calendar.. and with a little help from my friend.. the Forever Amber Read A Long was born! Please visit HF-Connection's Sign up post here.. This historical romance was first published in the 40's, so there is a strong chance your local library will have it.. unless they have banned it!! I can't wait to see what all the hub-bub was about! Hope to see you at HF-Connection!